All of my childhood I wanted a Jeep. In high school, I dreamed of my first car being a Jeep, but alas, it was a ’57 Chevy, but that’s another story. After college and four years in the Air Force, Janis and I settled back in NOLA on Jefferson Street. We had no money beyond what we needed, and the Lord supplied all our needs, but He had not supplied me with a Jeep. Along about 1975, my buddy, Buck Roy bought a Toyota Land Cruiser, the old flat fender model, which was almost a Jeep. And then my sister bought a little red Jeep. That did it! I HAD to have a Jeep then and decided the Lord needed some help. Heath and our M38A1 after a trip to the Bonnet Carré one Saturday. I found a very used, 1952, military surplus M38A1 Jeep for sale that had recently been freed from the Mississippi Army National Guard. It was so recently freed, it wasn’t even street legal, lacking some necessary lights. Top speed was 55mph. That was mainly because of the very low gearing in the axels. Its military 24 volt electrical system had been converted to 12 volt, and it did have a new soft top. Tires were almost new and in great condition, and it ran good. I bought it and commenced to make it street legal and eventually got a brake tag for it. It did, however, have about 200 coats of OD paint on it. In case you have never been in the military, it works like this: “IG inspection coming up? Paint everything!” (Because nothing looks as good as something just painted.) That did help prevent rust. I eventually added a layer of my own when I camouflaged it using rust red primer, yellow primer, and flat black. I then added white pinstripes to accent the body panels. It actually looked cool. Well, I thought so. Jeeps ain’t made for the road; they are made for the off-road, and the nearest such off-road was the Bonnet Carré Spillway west of NOLA. The fine silt sand in the Spillway could get past seals and eat bearings, so it was one of the worst places we could go play, but it was all we had. And we went running through every mud hole we could find to see who would get stuck. I am proud to say my little M38A1 never got stuck. Put that puppy in low range, first gear, and it would climb a greased flag pole. Elder son, Heath, was about six then. Ryan was only a year old or so. Heath made more than a few trips to the Spillway with “Uncle Buck” and me, but poor Ryan was too young. On one trip, we got hooked up with some guys with their jacked-up, big-tired pickups, and they challenged us by running through stuff they figured would stop the little M38A1 or the Toyota. We fooled them. One particularly hole of deep water, about a block long, nearly did us in, however. Heath and I dived in, and water came over the hood, but we puttered along with the fan blades of that little Hurricane Four Cylinder Engine slapping water and making fluttering sounds. “Dad! We have water inside! It did. We climbed out with the engine sputtering and spitting. I revved it a few times to keep it running, and eventually it dried out enough to run smoothly. After a few years I was making enough to buy a new vehicle, and Janis near fainted when I announced I was buying a new 1978 Ford Bronco—four-wheel drive, of course. That was the first year they came out with the full size Bronco like the Chevy Blazer. I had one of those, too, a 1978 Chevy Blazer to be exact, but that was nearly twenty years later. Heath found that one in Texas. The Jeep had to go. The Bronco was a lot more comfortable—it had AC—and it became the vehicle we used for all family trips. Heath and I made many a deer hunt in that Bronco, sleeping in beds I made in the back. While I never got the little Jeep stuck, I managed to get that big heavy Bronco stuck bad enough it took two vehicles to pull it out one time. It was buried down to the tub, and the tires could find nothing to grab. After the Bronco came the Jeep Cherokee Chief, also four-wheel drive. Made a bunch of deer hunts in that one too. After that no more four-wheel drive until the short-lived ‘78 Blazer mentioned above. It didn’t like humid Louisiana and quickly developed cancer. That was after it blew a head gasket on the way back from Alabama, and I had to have the heads rebuilt. I would have kept it if it had not developed the rust problem. I figured I was maybe past having another four-wheel drive vehicle. The Spillway had long since been closed to such use, and I had given up deer hunting. But I had one last fling with a 2005 Chevy Crew Cab Z71, but I only used the four-wheel drive once when it mattered, and that was on I-20 on the way back from Abilene in a snow storm. Both Heath and Ryan caught the Jeep bug, and both now have Jeeps. Heath’s is an older model that he is doing a body-off resto on, and Ryan’s is a newer model he has jacked up and put big rubber under it. 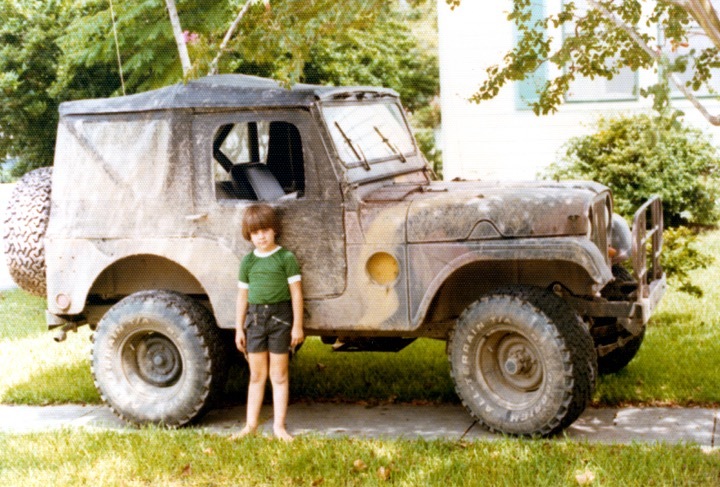 I have nothing now but a two-wheel drive Ford Crew Cab, but…I’ve been thinking of getting another M38A1, but one that someone has already restored.